Jess and I recently had the pleasure of visiting Vienna in Austria, a city that both of us were excited to visit. It’s a fantastic place for culture lovers, having played home to such icons as Mozart, Hadyn, and Strauss. It was also the seat of the vast Habsburg empire, which for a time was one of the largest empires in the world. As you can imagine therefore, there’s quite a lot to see and do here! 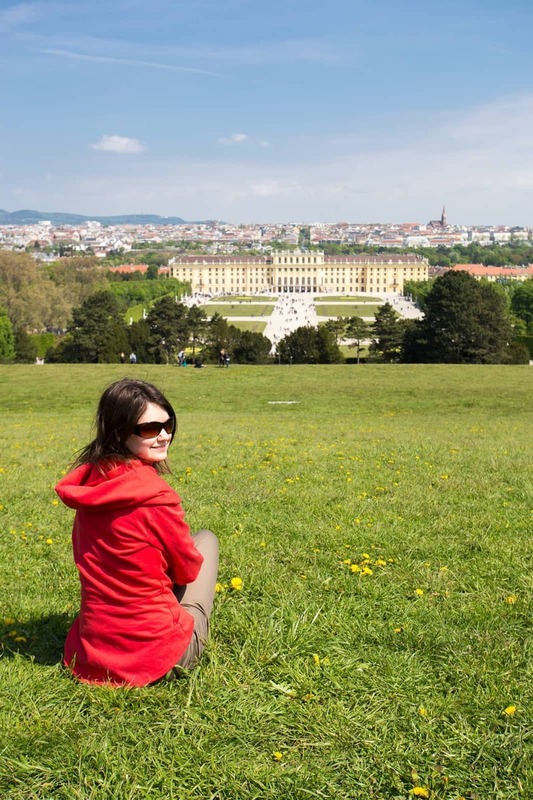 This guide is designed to give you some ideas for what to do on a two day visit to Vienna. I will warn you up front – two days is definitely not going to give you enough time to see everything! 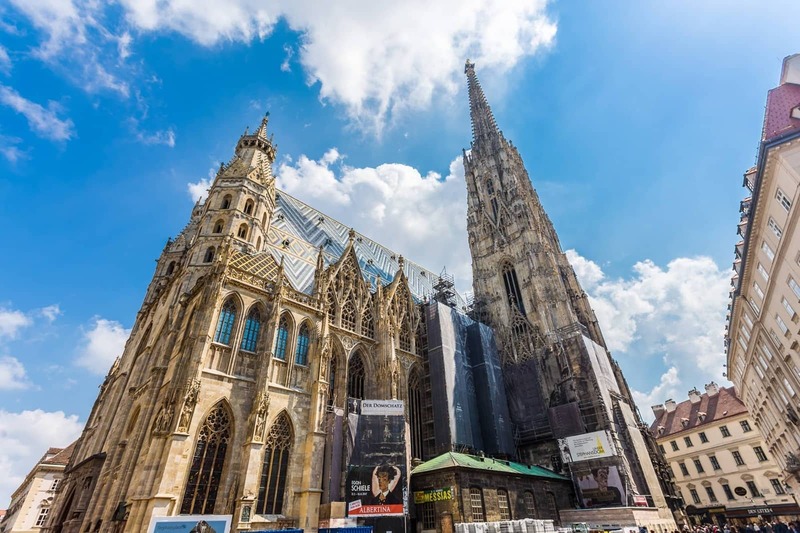 Vienna is stuffed full of museums, palaces, art gallerys, churches and restaurants, and you could spend a great deal of time here sight-seeing. So in this post I’ve tried to focus on some of the highlights and our favourite activities. We’ll also be putting together some longer itineraries if you’re lucky enough to have a bit more time to spend in this wonderful city. If you have more time, take a look at our suggestions for three days in Vienna. Where to see Live Music in Vienna? 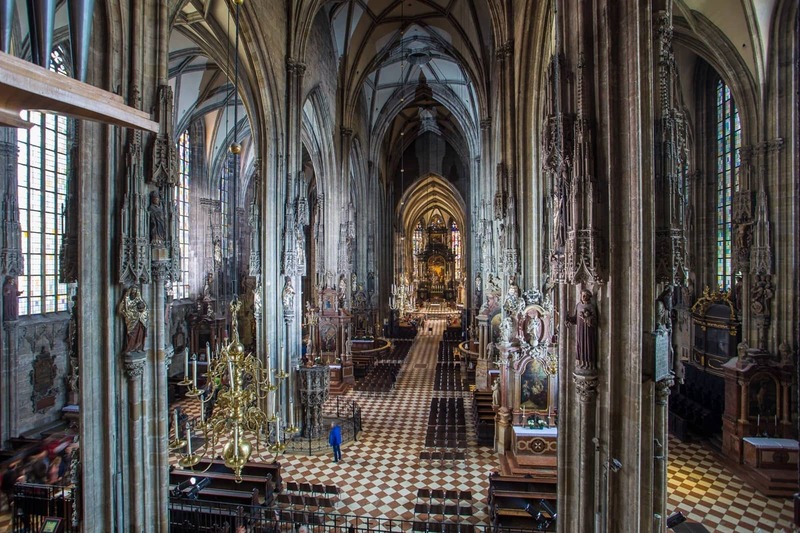 Right in the centre of Vienna, St. Stephens Cathedral is an icon of the city skyline, and the seat of the Catholic church in Vienna. There’s been a church on this location since the 12th century, although the current version with it’s stunning multi-coloured tiled roof was largely completed in the early 16th century. The church itself is free to enter, and being a popular attraction, it gets very crowded. We’d definitely recommend that you visit the treasury. This is a paid attraction, however it takes you up a floor or so above the main church floor, and as far fewer people visit, you can enjoy the views of the church interior with less of the crowds. It’s also included on the Vienna Pass. You can also head up both the south (136m high) and north (68m high) towers. These have individual prices – the south tower requires a certain level of fitness as it has 343 steps, whilst the north tower is accessible via a lift. Both offer close up views of the roof, although the south tower being higher offers more expansive city views. 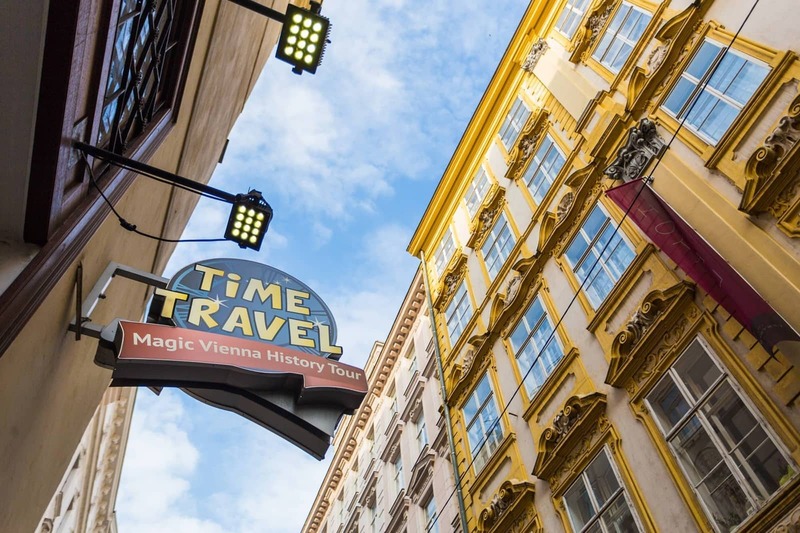 To get a fun overview of some of the history of Vienna, our next stop is the Time Travel Vienna experience. This is a 50 minute partly guided tour through an underground “adventure area”, which features a 5D cinema ride, animated mannequins, and guides who provide commentary and information (audioguides are also available in 10 languages). We really enjoyed this experience – it helped give us an overview of some of the key events that have shaped Vienna, from the time of the Romans through to the present day. It’s an excellent (and fun!) orientation, and should appeal to all ages. Time Travel Vienna is open daily from 10am – 8pm, with the last tour starting at 7pm. There’s a fee for entry, and you can check times and prices here. It’s also included on the Vienna Pass. Time for some museums. Vienna has a huge range of museums covering nearly every niche, so do feel free to swap different museums into this itinerary depending on your interests. There’s everything from Mozart’s House to a museum entirely dedicated to globes (one of Jess’s favourites!). The Albertina though, is definitely worth having on your itinerary. Partly a palace and partly a museum, it has an excellent collection of classic modernist paintings, including a number of works by Monet and Picasso on permanent exhibition. They also have over 100,000 photographs in their collection, some of which are displayed on a rotating basis. 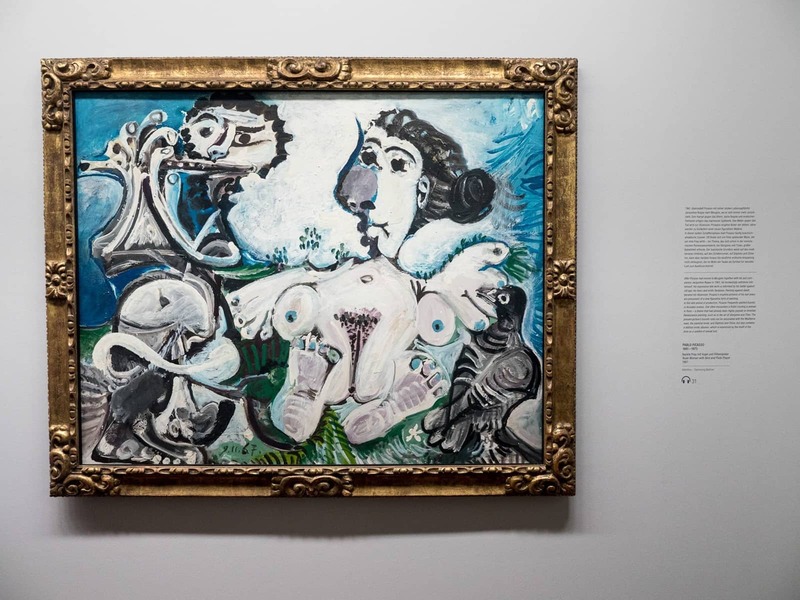 There are also rotating exhibitions from the Albertina’s collections of modern art, contemporary art, graphic art and architectural art, as well as guest exhibitions. Check their official website for details of what will be on when you visit. And don’t forget to also visit the staterooms when you do. The Albertina is open daily from 10am to 6pm, and until 9pm on Wednesdays and Fridays. There’s an admission fee – you can see more at the official website here. Entry is included on the Vienna Pass. Directly underneath the Albertina and in the site of one of Vienna’s few remaining ancient monastery cellars, this Austrian restaurant has been in the hands of the Bitzinger family since 1954. There’s a focus on excellent, traditional Viennese food, as well as their own brand of beer. This is an excellent place to grab yourself some lunch in between adventures in gorgeously traditional surroundings. Food in Austria tends to be fairly heavy (but delicious), so we recommend not over-ordering. Local specialities include Schnitzel, Goulash, Tafelspitz (boiled beef) and of course, Appel strudel. We loved eating here and are sure you will too. See their official website for opening hours and menu examples. Full from lunch, it’s time to push on for a bit more culture. Again, so much to choose from in Vienna, but we’re going to suggest two popular options which happen to be directly opposite each other and of the same exterior design. These are the Natural History Museum, and the Kunsthistoriche Museum, which sit right beside the Hofburg Palace complex and also Vienna’s Museum Quarter. Yes, Vienna has a whole museum quarter! 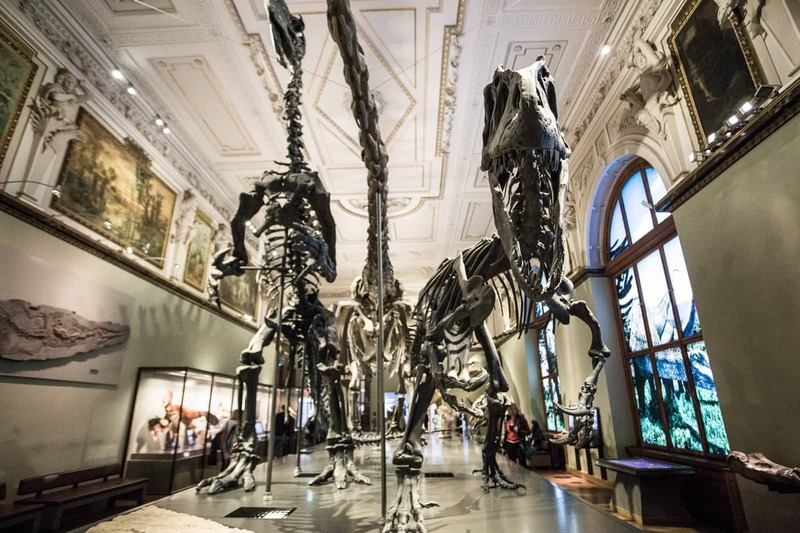 The Natural History Museum, opened in 1889, focuses on the natural history of the world, with everything from meteorites to dinosaur skeletons. The building itself is truly magnificent, built in a palatial style, and is worth visiting of itself. Directly across from the Natural History Museum is the Kunsthistoriche Museum, or Museum of Art History. 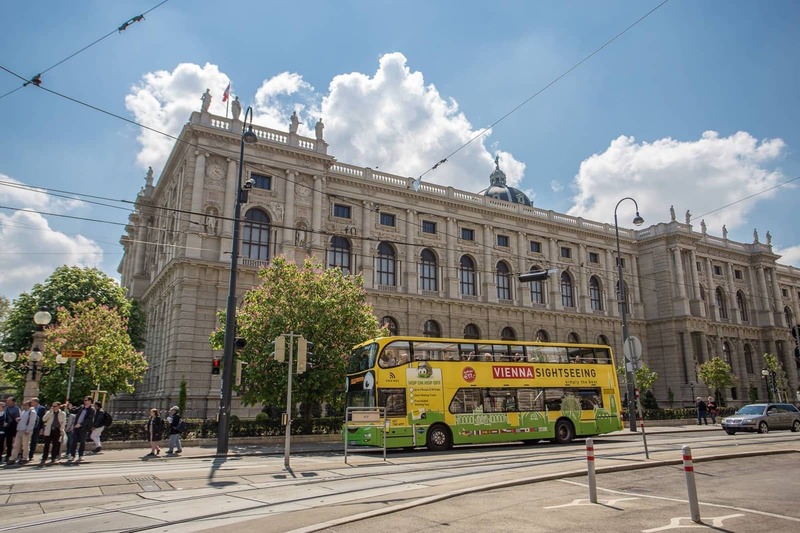 This is a massive museum dedicated to the arts which opened in 1891 – both of these buildings were originally built to house the rather extensive Habsburg collection and make it accessible to the public. The Kunsthistoriche Museum in particular features a large amount of pieces from the Habsburgs, and includes paintings, sculptures and antiquities. Fear not if neither of these museums pique your interest. 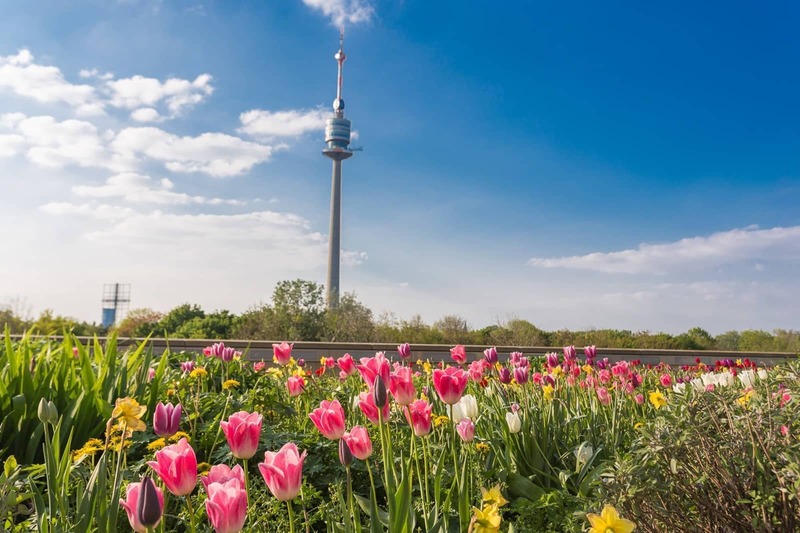 Only a few minutes walk from both of these you’ll find the Papyrus Museum, the Modern Art Museum, the Leopold Museum and of course the various Habsburg museums. You will definitely not run out of museums to visit in Vienna! 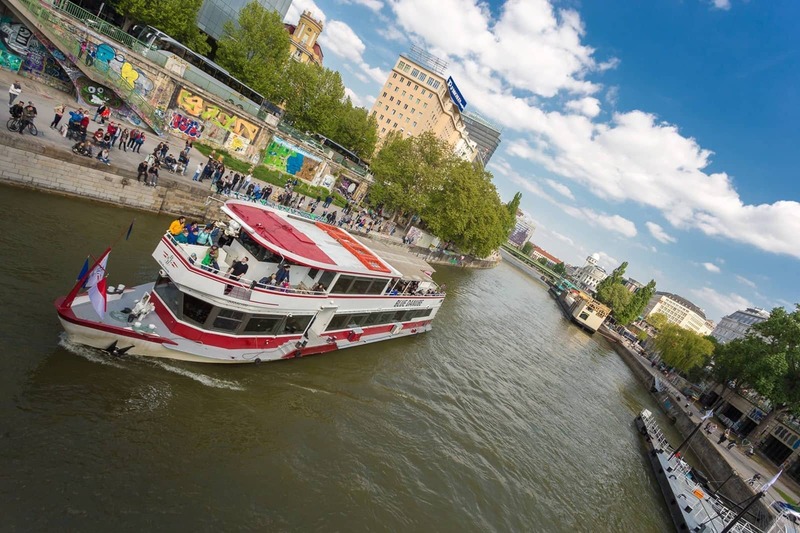 All that museum time might have you hankering for a more relaxing way to spend your afternoon, so we suggest that you allocate some time to taking a river cruise along the Danube River, or at least, the Danube Canal, an arm that branches off the main river and runs near to the old part of Vienna. There are a number of companies that offer river cruises of varying lengths. 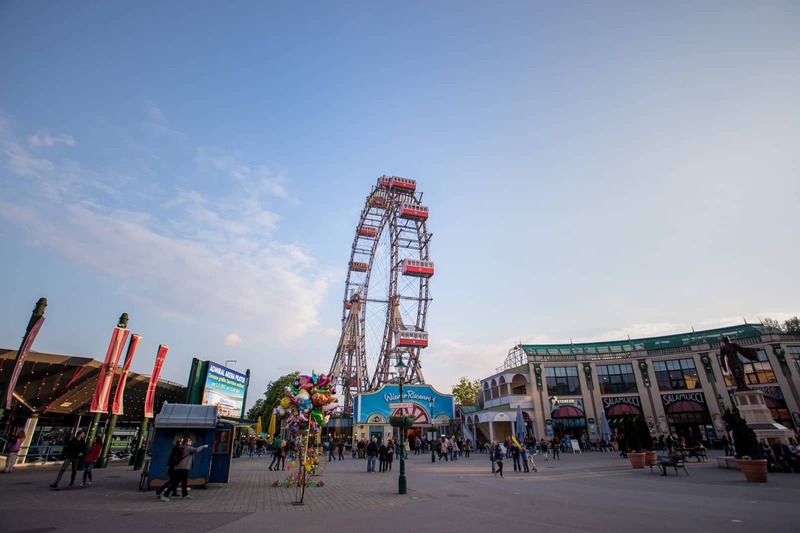 We took the option that was included on the Vienna Pass, a 75 minute cruise aboard the MS Blue Danube, which we enjoyed very much, watching the sights of Vienna roll by accompanied by a cold beer and some Viennese schnitzel. Definitely a good way to spend the afternoon! As you come towards the end of your first day, we think you might enjoy heading up into the sky for great views over the city. Ideally, you’ll have timed this for sunset, although of course this will depend on the time of year you visit. 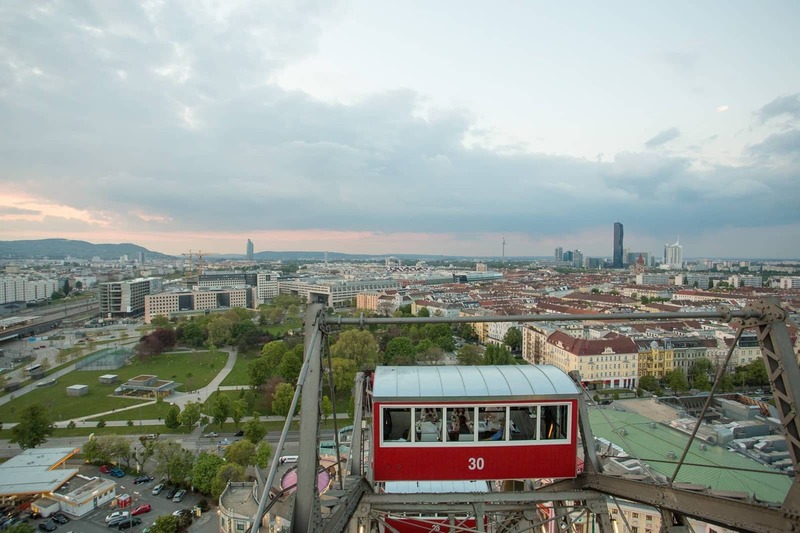 One of the best ways to get a great view of the city skyline is aboard the Vienna’s “Giant Ferris Wheel”, officially known as the Wiener Riesenrad. This is found in the Prater amusement park a couple of metro stops from Schwdenplatz where the city cruise departs and returns to. Originally built in 1897, the wheel was the world’s largest of its type for 65 years, and is one of the few surviving 19th century Ferris wheels. It was however heavily damaged in World War 2, so much of it dates from 1945. History aside, it’s an excellent place to get a great view of the Vienna skyline, especially at sunset. The ride takes around 20 minutes for one full revolution and is a nice way to end your day of exploring. There is a fee to ride it, and it’s also included on the Vienna Pass. 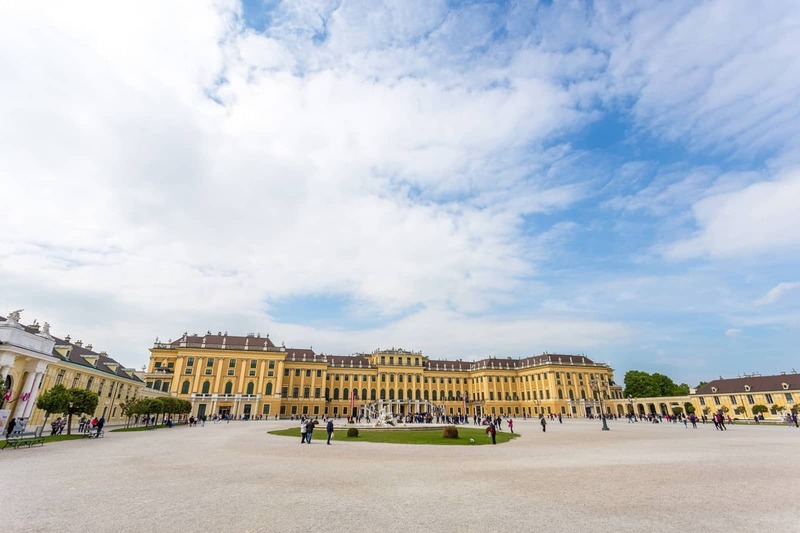 Schönbrunn Palace is a must-visit when in Vienna, and even though it will take up at least half of your second day in the city, we’d suggest it’s more than worth it. There’s a huge amount to do here, and we’d even forgive you for spending the whole day here and skipping the other attractions on our itinerary – there’s just so much to do here! The Palace itself, now a UNESCO world heritage site, was the centre of Viennese court life in the 18th century, and is one of the finest examples of Baroque architecture in Vienna. It was witness to a number of historical events, and was where a six year old Mozart had his first major concert. With over 1,400 rooms, it’s not exactly small, and there are hundreds of acres of garden to explore, with a number of attractions to visit as well. Being so popular means that you’ll want to arrive as early in the day as possible, especially if you want to do the tour inside the palace itself, as this gets booked up very quickly. We arrived at the palace before 10am, and the first tour wasn’t available until after 12! Thankfully, there’s plenty more to do than tour the palace. 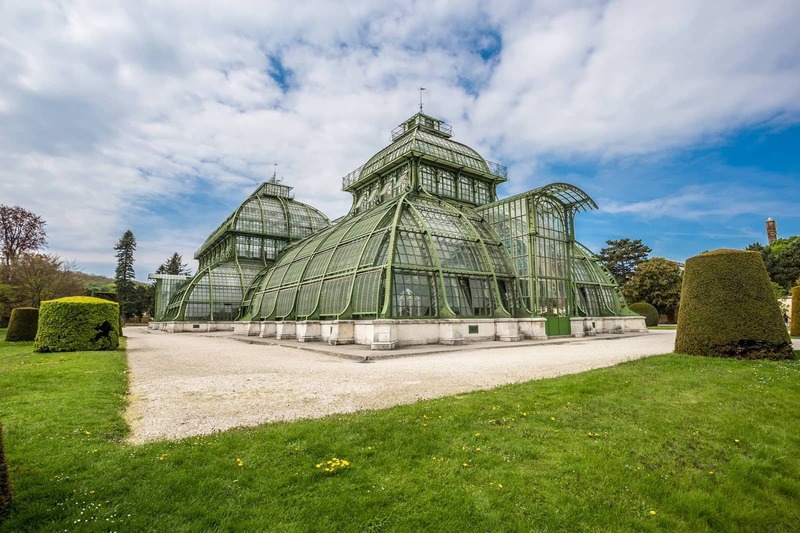 We’d highly recommend you visit the Carriage House, the world famous Schönbrunn Zoo (the oldest zoo and one of the best zoos in Austria), the Glorietta (which offers incredible views of the palace and Viennese skyline), the labyrinth, the Palmhaus and the Princes Gardens. We also loved the Strudel show, where you’ll learn how the famous Austrian dessert is made, plus get a slice of your own! Just wandering the grounds on a nice day is a pleasure of itself, and you could even bring a picnic to make a real day of it. Definitely not to be missed when visiting Vienna! Schönbrunn is a few kilometres outside of the city centre. It’s easily accessible by metro from central Vienna, and is also on the hop-on hop-off bus route. Schönbrunn Palace is open every day, including public holidays. Closing times vary depending on the time of year, but it opens every morning at 8am, when tickets and display rooms are opened. You can see opening times and prices here. 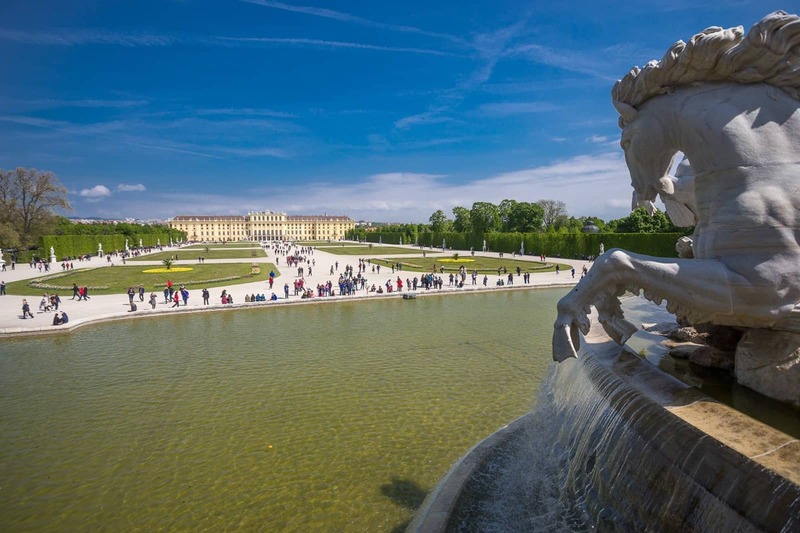 Schönbrunn Palace is also included on the Vienna Pass, and we highly recommend the pass if you are planning on visiting the palace, which is relatively expensive due to all the various attractions on site. If you manage to pull yourself away from Schönbrunn , we’d suggest taking the hop-off hop-on bus (also included in the Vienna Pass) to a couple more locations before returning to the city centre. First of these is the Vienna Museum of Military History. 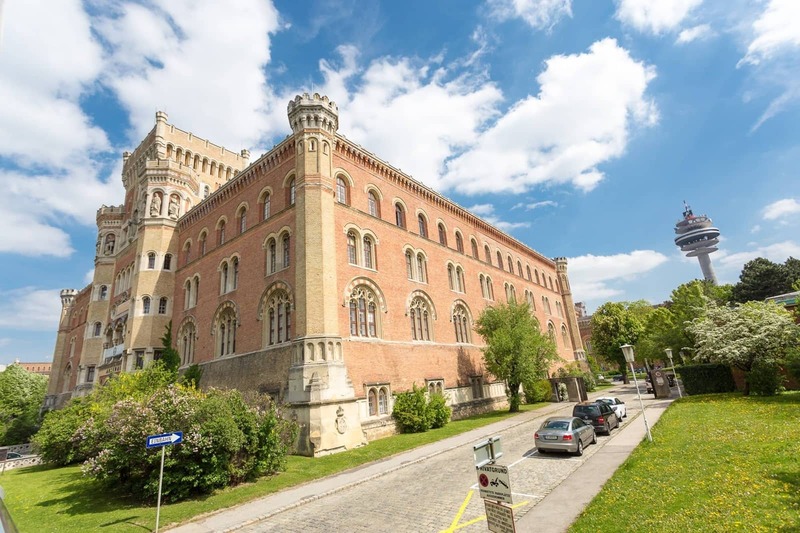 This museum covers the full history of the Austrian military, with everything on display from military weapons and vehicles through to uniforms and medals, spanning a time period of the 16th century up to the present day. It’s housed in Vienna’s oldest purpose built museum building, which formed a part of Vienna’s original arsenal complex. Again, almost worth visiting for the building alone! The Museum is open daily from 9am – 5pm, with some exceptions for public holidays. There’s an admission fee, and you can see full details of fees and opening hours here. Included on the Vienna Pass. 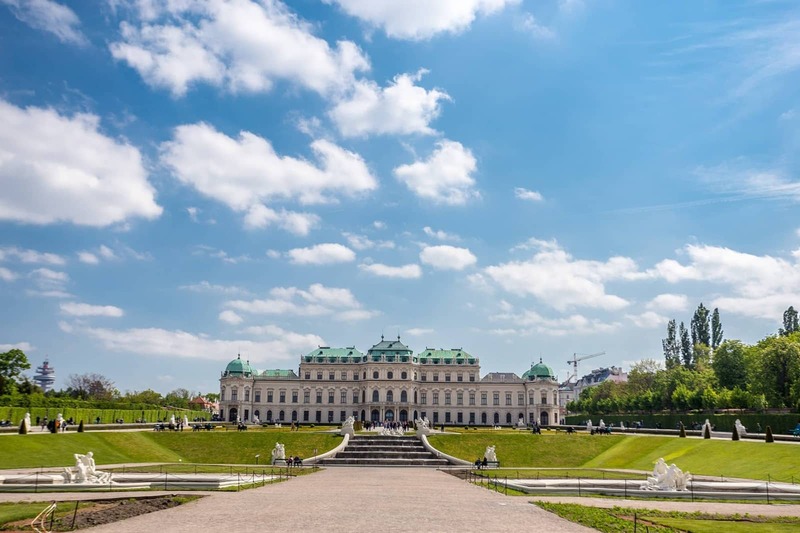 Further along from the Military History Building on the hop-off hop-on bus route (or a relatively short walk), you will come to the UNESCO listed Belvedere palace complex. This consists of two palaces, the Upper and Lower Belvedere and is home to the Belvedere Museum. These were constructed in the late 17th and early 18th century by Prince Eugene, at a time when magnificent buildings were popping up all over Vienna. The two palaces are constructed at opposite ends of the landscaped gardens, and were used by Prince Eugene as his summer residence. Today, as well as being able to visit the grounds, you can tour the Baroque-style palaces, which are home to one of Vienna’s best collections of Austrian Art, including the famous “Kiss” painting by Gustav Klimt. The Upper Belevedere is open daily from 9am – 6pm (9pm on Fridays), and the Lower Belvedere is open daily from 10am – 6pm (9pm on Fridays). Each palace has an individual entry fee, and you can see full details of fees and opening times here. Both are also included on the Vienna Pass. 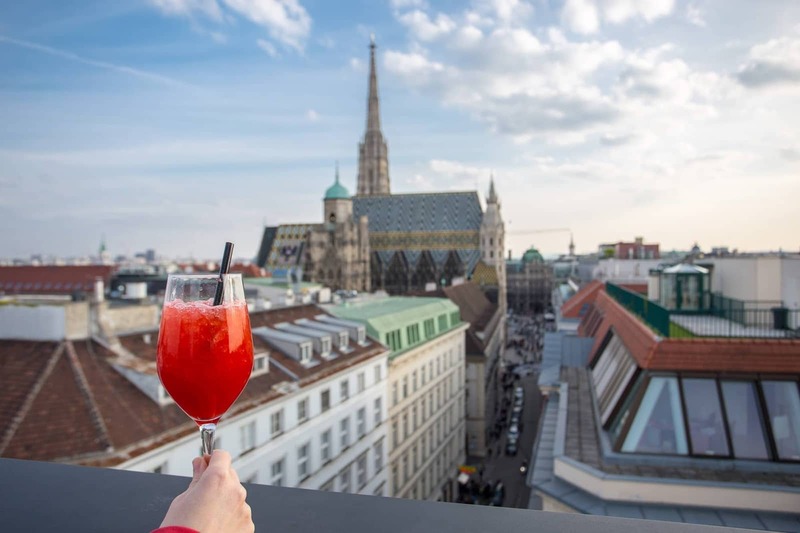 It must be time to relax after all that culture, and what better place to do that than at one of Vienna’s rooftop bars? There are many to choose from – we enjoyed cocktails at Cafe Bar Bloom accompanied by lovely view of Stephansdom and the sun setting over the city. They also serve snacks on the rooftop or you can head downstairs for a meal. 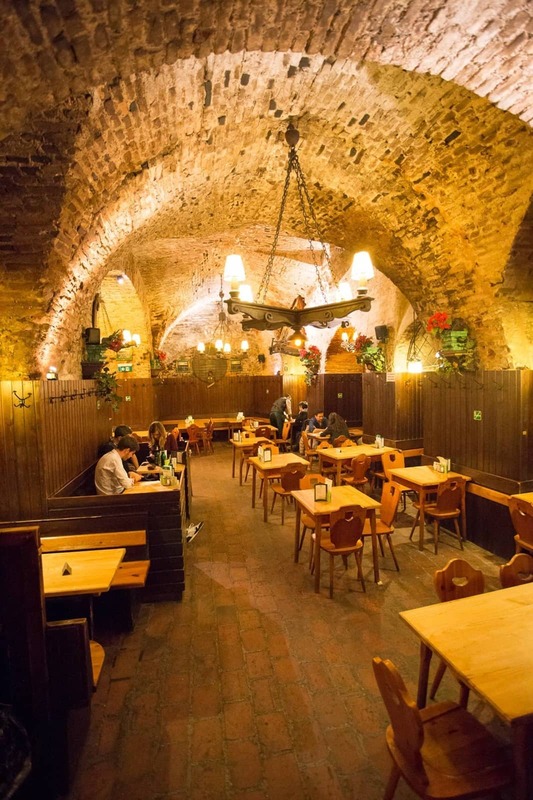 Just round the corner from Cafe Bar Bloom is another of Vienna’s monastery cellar restaurants – the Zwolf Apostkeller. 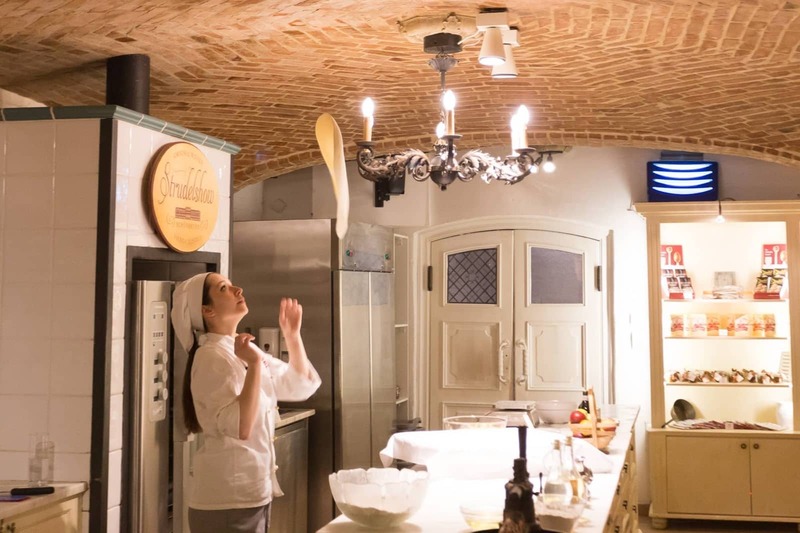 Housed in a building that dates from at least 1339, this winding maze of arched brick ceilings offers authentic old-world charm with classic Viennese dining and drinking options. You might also be serenaded by live musicians as you dine! A wonderful way to round out the end of this two day Vienna itinerary. Central Vienna is incredibly walkable, with the majority of the attractions located inside the “ring road”, which runs around the central city and follows the route of the old city walls. For attractions that are further out, Vienna has a good public transport system which will get you easily and quickly to all the main sights. If you think you’ll be using public transport extensively, investing in a transport card for your time in Vienna is likely going to be the cheapest option, although in our experience, we hardly needed them. The cards can be purchased at ticket machines located at all the subway stations in time periods of 24, 48 and 72 hours, and let you use all the public transport options in the city. Alternatively, you can buy tickets for the hop-on hop-off sightseeing bus which offers narrated sightseeing and transportation. It is also included as part of the Vienna Pass. This covers all the major attractions in the city, including those further out destinations like Schönbrunn Palace, across a number of routes. More on how to use the Vienna Pass to save money on your Vienna trip towards the end of the post. Like much of Europe, Vienna is a city that can be visited year round. A great many of the attractions are indoor, so even if the weather isn’t great, there will be no shortage of sights to see. However, we’d definitely suggest that the months of May and September are likely to be the best for visiting. The weather will be warm but not too hot, there’ll be lots of sunlight hours for exploring, and you’ll miss the majority of the summer crowds. Of course, sunshine isn’t guaranteed, so packing a light raincoat is advised, but on the whole you should get good weather in these months. If you can’t avoid travelling over the summer, check out our top tips for surviving a European city in summer to preserve your sanity! Your accommodation is very likely to come with free Wi-Fi, and you’ll also be able to get online in most cafes, bars, and restaurants. For mobile data, you have a number of options depending on your phone. First, check if your cell phone provider has some form of overseas roaming policy. I use (and love!) the Three network in the UK, because it lets me use my home data allowance at no extra charge in nearly 50 countries, including Austria. So I can just roam without worry on my unlimited data package. A number of other providers offer roaming plans, so check with them first. You can also buy a pay as you go SIM locally in Austria when you arrive – see a list of prices and packages here. You should be able to pick up a pay as you go SIM for under €20 with more than enough data for your trip. Austria uses a two pin 220v system like the majority of continental Europe. If you’re coming from the UK you’ll need an adapter. Travellers from the US will also need an adapter, and to check that their equipment supports the 220v standard. In our experience, laptop and mobile phone chargers will support voltages from 110 – 240v, whilst hairdryers and curling irons may not. Supported voltages should be clearly marked on the power adaptor for the device – if in doubt, don’t plug your device in as it could cause serious damage. As we often do when visiting a city like Vienna, we opted for an AirBnB apartment. This was around 100 USD per night for an apartment to ourselves right in the city centre, and meant that we had room to work, cook meals and do our laundry. Of course, there are plenty more options than AirBnB in Vienna, with everything from hostels through to luxury five star hotels. 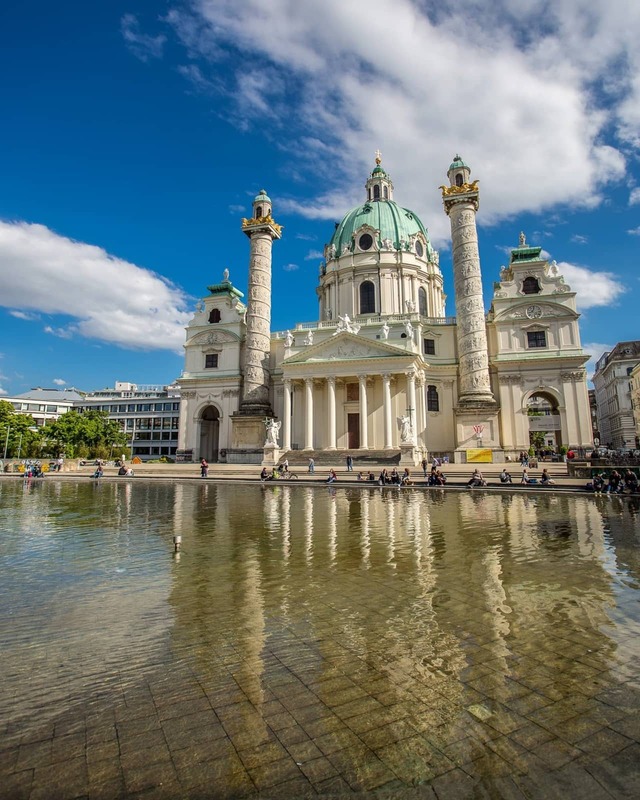 We recommend you check out the Vienna listings on Booking.com if you prefer a hotel stay, we find they usually come back with the widest choice and best deals – plus they have apartments now too. wombat’s CITY Hostels Vienna – Found in Naschmarkt, near the large city market, and close to the museum quarter, this is a highly rated hostel that offers both dormitory and private rooms at a great price. For hostels, also consider CH-Hostel. CH-Budget Centre Rooms – at the budget end of the spectrum, this is a well located guesthouse offering free wifi, private bathrooms and TV’s, with a good value breakfast also available. Motel One Wien-Staatsoper – just 100 yards from the Vienna State opera, this three star property is fantastic value. Air conditioned rooms are all en-suite, and WiFi is available throughout. We recommend you checkout the Vienna listings on Booking.com if you prefer a hotel stay, we find they usually come back with the widest choice and best deals, plus once you book a few times you get access to Genius discounts, which can save you even more. For more tips and ideas on how to get the best deals on accommodation (and more! ), check out our comprehensive travel resources page. If AirBnB sounds good to you, use this link to score a saving off your first trip. And, don’t forget that AirBnB is far from the only game in town when it comes to finding accommodation! Check out our guide to our favourite AirBnB alternatives to see what’s out there! A popular question that we are asked from visitors to Vienna is where to attend a classical music concert in the city. There are many venues throughout the city which offer live music, from the opera house through to performances in churches, many of which will be classical music concerts. The best thing to do is to visit this page on the official website for Vienna, which has event listings for every type of musical event, and in particular, classic music lovers will want to check out the Classical Music listings. You can purchase tickets for live music in Vienna on this website. 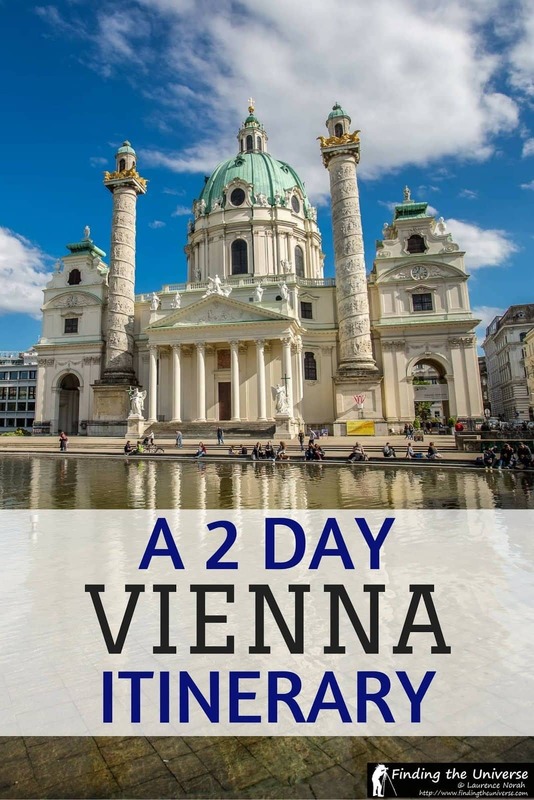 Vienna is definitely not a budget city, and the majority of the attractions listed on this two day itinerary have an entry fee. You can however save serious money on Vienna sight-seeing by investing in the awesome Vienna Pass. Seriously, it’s awesome. To give you an idea of how much you can save, visiting all the attractions I’ve listed on this itinerary would cost you well over 200 euros. In particular, the various sights at Schönbrunn each carry an individual price – just visiting all the highlights I’ve mentioned at Schönbrunn would add up to nearly 70 Euros! Conversely, a two day Vienna Pass only costs €95. It’s incredibly easy to use, normally requiring just a quick scan when you arrive at an attraction and it also includes skip the line access at a number of locations as well, meaning you can make the most use of your time. Everywhere I’ve listed in this itinerary, with the exception of St. Stephen’s north and south towers (and meals of course!) are included on the Vienna Pass. 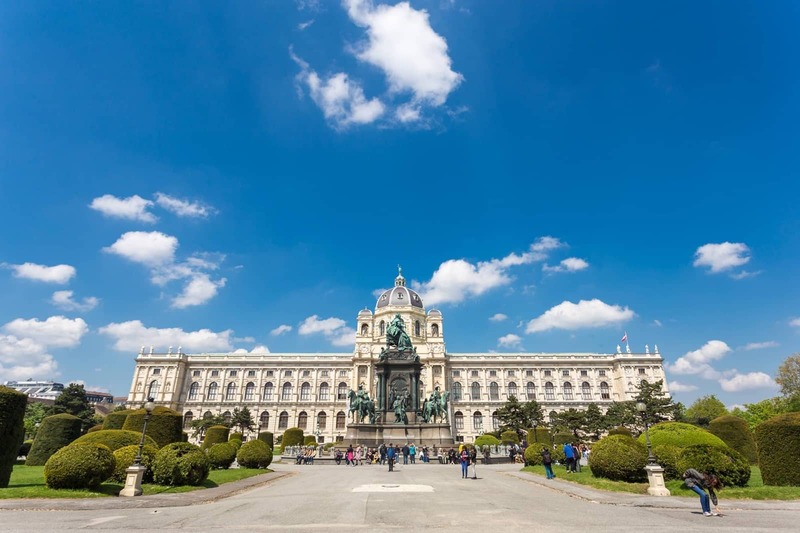 In fact, the pass comes with free entry to over 60 of Vienna’s most popular attractions, meaning you can slip in a few more sights onto the list above without it costing you anything more. We’ve used city passes and museum cards in destinations around the world, and love how much money they save us on sight-seeing. 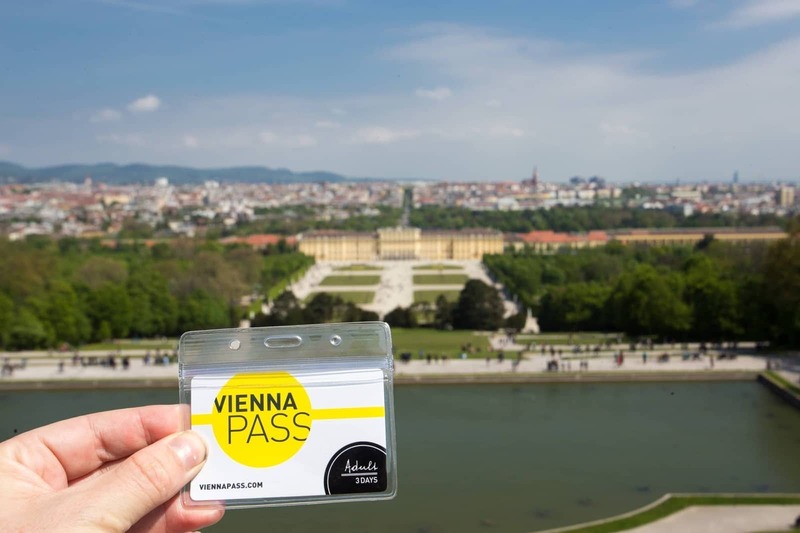 We highly recommend the Vienna Pass to anyone looking to save money in Vienna – it’s definitely one of the best value city passes we’ve ever used! You can reserve one in advance here, for easy collection on arrival in the city. This post should give you nearly everything you need to plan out your two day Vienna itinerary. On top of all the above though, we have some additional content and resources we think you might find useful. Some of this is content we’ve written ourselves, and some is content from around the web or that you can take with you. Do check back from time to time and bookmark this page, as we’re always updating and adding new content to our sites to help you make the most of your travels! If you liked this itinerary, check out some of our other detailed itineraries, which cover cities, countries and road trips around the world. And that sums up our post on how to spend two fantastic days in Vienna! There’s lots to do here for many more than two days, and we’re going to be putting some more posts together covering longer itineraries. In the meantime, if you’ve got any questions or thoughts on how to spend two days in Vienna, let us know about them in the comments below! How exactly does one book the strudel show at Schönbrunn? Can I do it in advance, or do I do it during my visit? If so, where do I go to register? You can do it in person, which is what we did, however, if you prefer to book in advance you can just e-mail them: residenz@cafe-wien.at. I was always interested in Vienna, but now I’m sold. Your blog definitely encouraged me to go, lots of good info. Thanks very much Eddie – have a lovely trip and let us know how it goes! What form of transportation did you rely on most for this itinerary? The hop-on/hop-off buses, the tram, or the subway? It was a combination of walking and the hop on hop off bus. We did buy a Vienna travel card which was good for the subway and bus, but we ended up using those far less than we initially thought. A superb article with a piece of very helpful information which really help all travelers who want to go to Vienna. Nicely done everything. Keep it up the best work. How did you travel around Vienna,did it take you too much time to get around different places.Also did you get the Vienna travel card. For the most part we walked, which was easy to do. For the palace, we took the hop on hop off bus which was included with the Vienna Pass, which took us straight there. For some of the other locations we took the metro. We did get a 3 day travel card, but to be honest, we didn’t use it enough to make it worth it as the hop on hop off bus was pretty good, and then we walked nearly everywhere else! I will be in Vienna Sep 8th at night and leave Vienna to Budapest on Sept 11th at 6:30 night. i bought two days Vienna pass for 9th and 10th. we are not found of musumes but love castles and other activites. would you be able to provide an itenary for two days and what to do without Vienna pass on 11th for more than half day. When you are looking for things to do without the pass, there’s the Naschmarkt, and also there are some really nice cafe’s that you might want to visit. I always check your blog before planning a trip – always extremely helpful. I have purchased 1 day Vienna pass. What sightseeings can I cover along with Schonbrunn palace on that day? My thinking is: Schonbrunn palace,Hofburg,Ferry wheel at Prater and St. Stephen’s Cathedral Treasury. Do let me know if covering all this is possible in a day? Kindly provide some editing if this is not possible. (Note: Would like to cover mixture of architecture and history) Thanks. That sounds very possible to us – just don’t spend too long at Schonbrunn to be sure you see everything else you want to see. One more thing I need clarity on, I will reach my hotel in Vienna on 13th August around 3:30 p.m. I will leave from Vienna to Innsbruck on 15th August at around 11:30 a.m. I am confused whether I should buy 24 or 48 hour Vienna pass. The Vienna Pass lasts for only one full day, from midnight to midnight. So if you started using it at 3.30pm, that would count as a full day. So my advice is to take the one day pass, and just to use it on the 14th. Otherwise you don’t have enough time to take advantage of it on the afternoon of your first day, or morning of your last day. Thanks for your reply. Just have few more questions, I will stay in 25hours Hotel MuseumsQuartier at Vienna. We have our evening free on 13th August and entire day of 14th August. What should be done on 13th Aug(assuming I do not take a Vienna pass for that day). Also can you pls suggest an itinerary for 14th August regarding sightseeing to be done. Thanks in advance. Hi Mayank! It’s really up to you what you do. A popular option in Vienna is to see a classical concert (see the post for instructions on how to find one of those). Some of the attractions are also open later in the day. Hi, I am visiting Vienna in mid August 2018. How is the climate/weather likely to be? August is likely to be pretty good, temperatures should be around 22C – 28C, and it should be sunny. Of course, rain is possible at any time of year, but is less likely in August. I hope this helps! Thanks for your prompt response, however will the climate be too hot? We are visiting Swiss and Austria in mid August. I am from India. HI Mayank – I think it’s unlikely you will find it to be too hot, as Europe is not too humid. I haven’t visited India, but my understanding is that it is usually quite hot and humid there, so I think you will be fine! Should 1 day Vienna pass be taken? A 2nd question about a train from Munich to Austria. Are there various? If so pros/cons? If not, thanks. My pleasure Cyndi 🙂 There are a number of direct trains between Munich and Vienna (I assume you want to go to Vienna :)). Happy to help with any more questions of course! My adult daughter and I are finishing our August 2018 trip in Vienna. I fantasize attending a Strauss concert (possibly with dinner) although the music is the priority. Hi Cyndi! This is quite a popular request, so I’ve updated the post with a little section on attending concerts in Vienna. In summary though, my suggestion is to check out the official city website for classic music event listings (https://www.wien.info/en/music-stage-shows/classic). A church concert is a popular option, but the cafe’s also host music if you want it accompanied by some food. I hope this helps – have a wonderful trip to Vienna! Thank you for your reply and link. Much appreciated. Hi, me and my co-brother [husbands of 2 sisters] are reaching Vienna by car from Salzburg via Melk on the evening of 12th June. We have 2 full days [13,14] before we drive off to Budapest. Your itinerary appears very useful and we will definitely keep it in mind all the advise u have given. Thanks Vikram – have a great trip! Going in Aug for 2 days. Would love to go to a concert as well as some of the other things on your itinerary . Any suggestions? Thank you very much. I am really interested in hearing Strauss waltzes so I will look into that venue. Thank u so much for the blog…very detailed and have all information i was looking for …one of t best vienna blogs i have read so far…going to vienna this may…thank u for all help! My pleasure – have an excellent trip! That is a fantastic Christmas present – you’re going to have an amazing trip. Enjoy! We are going next month, thank you for helping me plan our vacation! Our pleasure Anna – have a wonderful trip!